Are you passionate about heart health? Our red ribbon heart shirt will definitely help you spread the word about a number of heart conditions. Whether you're participating in Jump Rope for Heart or another fundraising event, you'll show your passion for this cause whenever you rock this shirt. 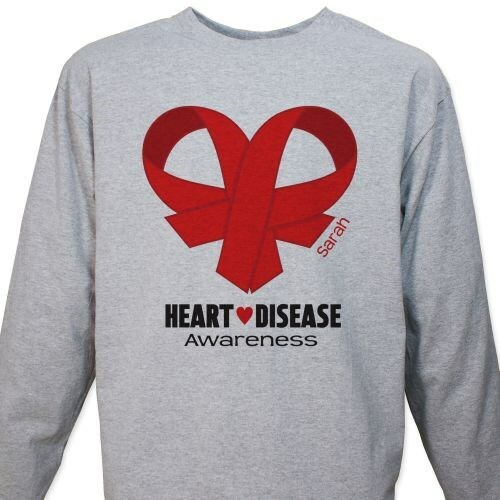 This Heart Disease Awareness Shirt is available on our premium 100% cotton long sleeve shirts, machine washable in youth sizes S-L and adult sizes S-2XL. Free personalization of any name is included. Additional Info Our selection of heart disease awareness apparel will have your fundraising team looking better than ever as they promote a heart healthy lifestyle! This red ribbon heart design will be a huge hit among your team. Our Heart Disease Awareness T-Shirt is another popular design.